Along with my Zero 45, I brought my Terrapin Bijou with me on that pinhole adventure in Olympia with my fellow PNW pinhole enthusiasts. I had my Bijou loaded with Velvia from a previous pinhole adventure at a graveyard. I caught this group just as a tour of the capitol building was underway. 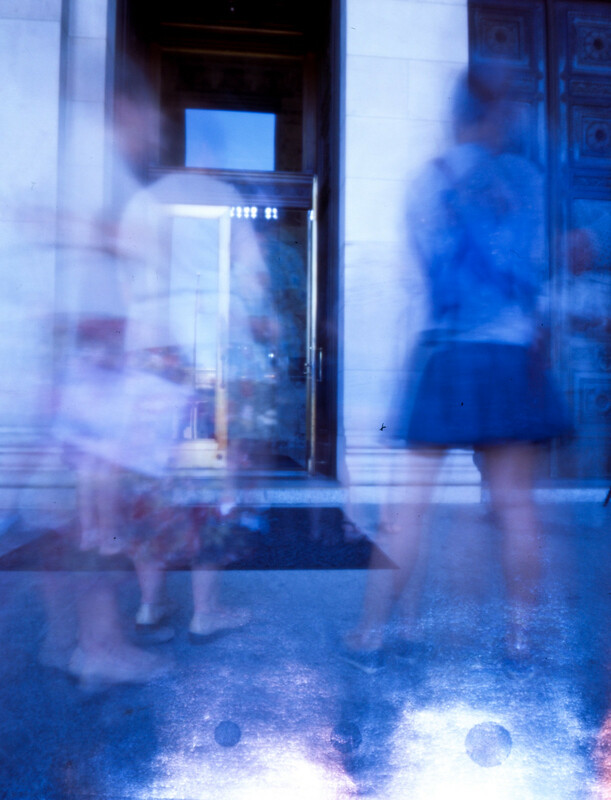 I love it when I can capture crowds in my pinhole photography. It’s hard to know what they will do in the seconds or even minutes that you are making an exposure which makes it fun to look a the final image when it comes back from the lab. it was! the sun burned through the backing of my film! An extremely evocative photograph, Moni. I love it. It will only get better as it gets older. It is as though the spirits of the people are shimmering through the light. In 50 or 100 years time, when the subjects are very old or have passed, its resonance will be even greater.